(2001 'Blue Bella') (52:52/14) Moss hat einige Jahre in der Band von Jimmy Rogers gespielt, bevor er seine eigenen Flip-Tops gründete. Hier auf seinem ersten Album re-interpretiert er auf sympathische Art die verschiedenen Spielarten des Blues in Chicago, schaut jedoch auch über die Ortsgrenze und bedient sich in anderen Regionen wie Texas und Louisiana. Ein aüsserst erfrischendes Album mit vielen aufregenden Nuancen. Moss ist eine richtige Entdeckung! Moss belongs to those few up-and-coming blues guitar players from Chicago. For a couple of years he was Jimmy Rogers' guitar player before he founded his own band, the Flip-Tops. On his debut he is re-interpretating the different styles of the blues from Chicago. But he is also taking ingredients from other regions, like Texas and Louisiana for his on blend. All originals. Moss is a very talented player, and this is a superb debut. NICK MOSS - gtr/voc, LYNWOOD SLIM - hca, DONNY NICHILO - pno, SHO KOMIYA - bass, KENNY SMITH oder/or MARK FORNEK - drums, plus horns (5 tracks). 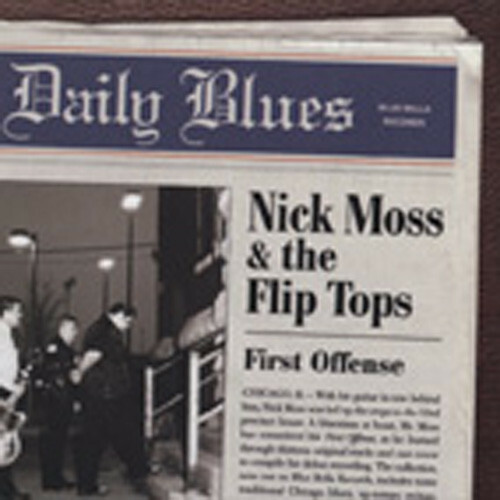 "MOSS & THE FLIP TOPS, Nick"
If electric blues guitar as we've celebrated it throughout these four collections is going to thrive—or even survive—in years to come without degenerating into watered-down blues-rock, it requires an infusion of committed youngblood axemen who revere and intuitively understand the hallowed tradition while steering it into fresh directions that aren't too far removed from the past. That's a mighty difficult proposition; many try, but only a precious few succeed. In case you haven't had the pleasure yet, meet Nick Moss. The burly guitarist has been anointed as a savior of traditional Chicago blues, his albums on his own Blue Bella label reflecting a deep love for his Windy City blues ancestors. "That's what I learned how to play," says Moss, born December 15, 1969 and a native of Chicago's northwest suburbs. "Like I've always told people that always ask me, I kind of got stuck with this label over the last couple of years of being the torchbearer of Chicago blues. I didn't set out to do that. I live in Chicago, and I was taught by the guys that played Chicago blues pretty much what I know." Those famous teachers included guitarists Buddy Scott and Jimmy Dawkins. Back when he was in their respective bands (Nick was only 18 but big for his age when he joined Scott), Moss played electric bass. He'd mastered the instrument through headphones during a six-month stay in the hospital with serious kidney problems while he was a teenager. His older brother Joe, now a popular Chicago blues guitarist himself, brought him the earphones and was an essential influence. Midway through four years in the Legendary Blues Band, its leader, ex-Muddy Waters drummer Willie ‘Big Eyes' Smith, suggested Nick switch to guitar. Smith recommended Moss to former Waters guitarist Jimmy Rogers, and Nick stayed with Jimmy for nearly three years during the mid-‘90s, absorbing the nuances of what a blues ensemble should sound like. From there, Moss was ready to form his own combo, the Flip Tops. Blue Bella launched in 2000 with their ‘First Offense,' and he's done seven more discs since, earning a raft of Handy and Blues Music Award nominations. There'll no doubt be plenty more. Check My Pulse, from Nick's 2005 album ‘Sadie Mae' (named after his then-year-old daughter with his wife, guitarist/bassist Kate Moss), is a solid example of Nick's tight-knit ensemble sound, supplied by pianist Bob Welsh, rhythm guitarist Gerry Hundt, bassist Dave Wood, and drummer Victor Spann. There's room for a stinging two-chorus Moss guitar ride right after Welsh rolls the ivories; Moss doesn't hog the spotlight, and he makes every note count when he does solo. Moss is also conversant on harmonica and bass, not averse to switching off mid-set to either one. He's not afraid to change up his sound either; his 2010 CD ‘Privileged' found him surprising longtime followers by veering into blues-rock. "You know how you can go to a show, and no matter how good the artist is, sometimes it can get a little stale," he says. "We always try to switch things up and make things different. I always tell the people we're trying to give you more for your money." If Nick Moss is any indication of the future of electric blues, the idiom rests in strong, capable hands. Customer evaluation for "First Offense"